Ireland’s Cliffs of Moher on the Wild Atlantic Way in County Clare. Ireland’s Cliffs of Moher, a gem in the crown of the Wild Atlantic Way, continues to be the most visited natural attraction in the country, with its eight kilometer stretch of ragged rock walls clawing 214 meters (702 ft.) above the Atlantic Ocean. 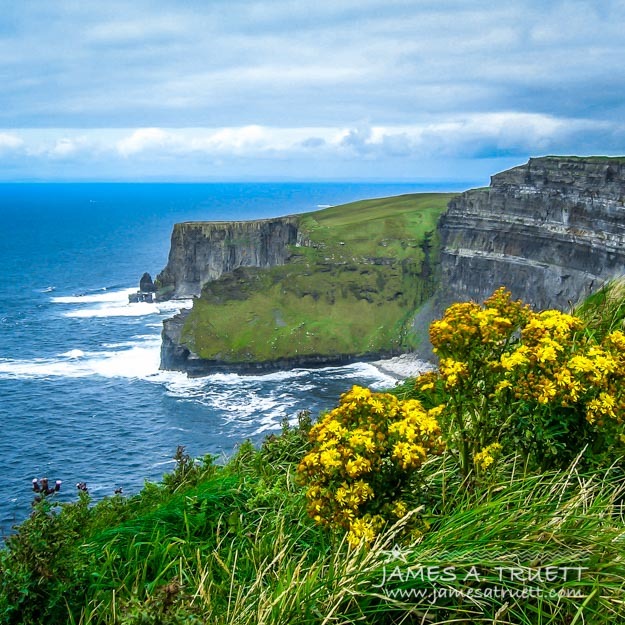 From the cliffs, located near Liscannor in County Clare, an estimated one million visitors annually take in views out to the Aran Islands, north to Galway Bay, and south to Loop Head and the Dingle Peninsula in County Kerry. This image appears in my best-selling book, Magical Irish Countryside, the third volume in my Mystical Moods of Ireland series. The cliffs are named after the old Fort Moher, which once stood at Hag’s Head at the southern end of the cliffs. A €32 million (roughly $42 million USD) visitor center opened in February 2007 — in keeping with an overall plan to preserve the natural surroundings, the earth-sheltered center is built in to the hillside next to the cliffs.